Well it's that time of year again! I have to say that I'm not a big lover of Valentines. It is always a massive let down for me and every year I think maybe, just maybe he'll pull it out of the bag. In reality though I think I have only been totally surprised and spoilt twice on Feb 14th in the 29 years that we've been together. But in fairness I do agree that it is just a commercial exercise with restaurants full and overpriced and flowers twice the price as the day before and the day after. I know I'm a misery but in saying all that, I do always like to semi nod to the day. A few tea-lights, a couple of glasses of fizz and something yummy for dinner followed by something delicious for dessert. With the hybrid craze last year I thought I would knock one up of my own. 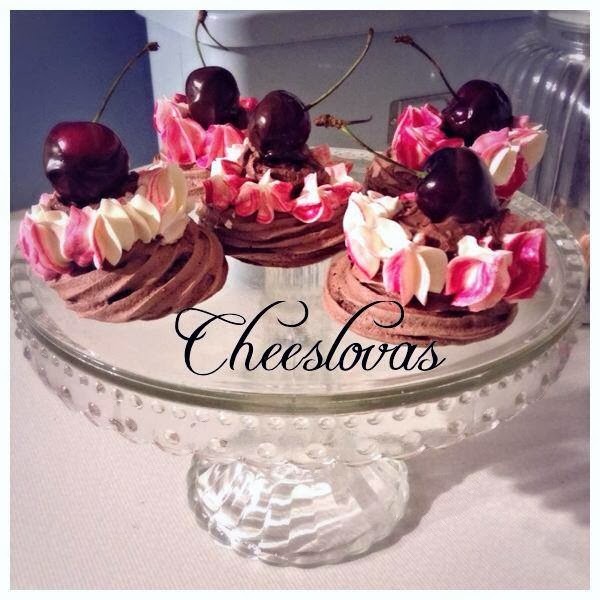 So with slight tongue in cheek, I give you Cheeslovas (my Cheesecake & Pavalova marriage). In a free standing machine or with an electric hand whisk, whisk the egg whites until the reach a soft peak stage. Slowly add the sugar and whisk until glossy. Now fold in the cocoa, making sure that you incorporate completely. Next spoon into a piping bag fitted with an open star nozzle and pipe 4 meringue nests, or heart shaped nests onto the lined baking tray. Bake at 100 for about 70-80 mins. Next heat 150ml of the double cream to boiling, leave to cool for about 3 minutes then stir through the chocolate until smooth and glossy. Heat the jam and then sieve, use the fruit in the sieve to stir into the ganache, then pop into the fridge to set completely. Set the sieved part of the jam to one side to cool. In a bowl whisk the cream cheese, double cream and icing sugar together. Then swirl the sieved cold jam through it and spoon into a piping bag fitted with an open star nozzle. To assemble. Using either a mini ice cream scoop or a tablespoon, scoop 4 balls of set ganache into the chocolate nests. Now pop the biscuits into a sandwich bag and bash with a rolling pin, sprinkle over the ganache balls. Next pipe the cream cheese mix around the edges of the ganache and finish with the chocolate cherries.